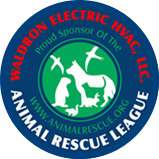 Waldron Electric, Heating & Cooling are proud sponsors of the Animal Rescue League, located in Pittsburgh since 1909. SAVE UP TO 10% ON MOST SERVICES! Save up to 10% on most Waldron Electric services by becoming a supportive member of the Animal Rescue League! For only $55.00, you’ll not only be helping numerous pets find new and loving owners, but you’ll also save up to 10% off of your service call! Your membership also qualifies you for special offers and promotions from Waldron Electric.